EMA is encouraging marketing authorisation holders (MAHs) intending to submit Brexit-related Type IA and Type IB variations in March 2019 to file these variations as early as possible during the month. This will enable EMA to process the submissions before 29 March so that MAHs can receive confirmation of compliance with the regulatory and legal requirements before this date. Type I variations are minor changes to the marketing authorisation of medicines for human and veterinary use. Brexit-related changes to be submitted as Type I variations include changes to sites responsible for batch release, physical importation, batch control testing of finished product and update of CE marking documentation for medical devices co-packaged with medicinal products. The Agency foresees a significant increase (over 50%) in the number of Type I variations in the next three months as companies submit pending Brexit-related changes to their marketing authorisations. In order to help MAHs ensure their Type I variations are complete and correct before submitting them to the Agency, MAHs should use the pre-notification checklist before submission of any Type IA or Type IB variation and to follow the regulatory and procedural guidance on Type IAs, Type IBs and the specific guidance on variations related to the submission of Brexit-related changes . To support the identification and tracking of Brexit-related eCTD submissions, applicants should ensure that the Brexit box is ticked when eSubmission web UI is used (.xml delivery file created). To facilitate the smooth processing, MAHs should not include editorial changes as part of Type IA and Type IB submissions during the next three months. For more information on what can be considered an editorial change please refer to question 4-Editorial changes of EMA’s post-authorisation procedural advice. For procedural or regulatory queries related to Type I variations for medicines for human use, MAHs can send an email to: iaquery@ema.europa.eu or ibquery@ema.europa.eu. 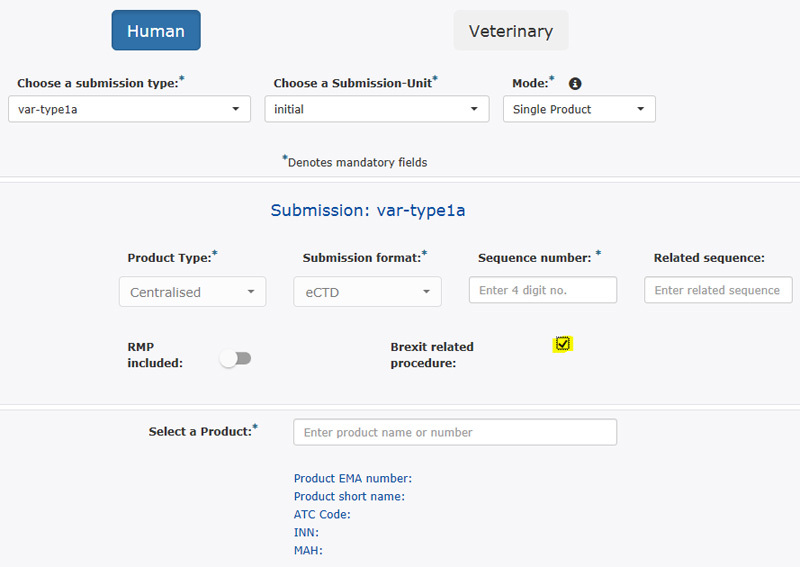 For medicines for veterinary use, the following e-mail address should be used: vet.applications@ema.europa.eu. General Brexit questions not related to submission of changes to the dossier should be submitted to EMA using this contact form. Most MAHs have shared their plans for the submission of Brexit-related post-authorisation changes with EMA. To report any changes to their plans, MAHs should send an email to emabrexitsurveyfu@ema.europa.eu (cc-ing the product lead for the product and the product mailbox). Type I variations are changes to the terms of the marketing authorisation that have only a minimal impact, or no impact at all, on the quality, safety or efficacy of the medicinal product concerned. Type IAINvariations must be submitted immediately to EMA following their implementation to guarantee the continuous supervision of the medicinal product. Type IB variations must be notified to EMA before implementation, but do not require a formal approval. Upon acknowledgement of receipt of a valid notification, the MAH must wait for a period of 30 days to ensure that the notification is deemed acceptable by EMA before implementing the change.